Update:24/10/2018Note: This has been stopped, so you will only get 200MB if you try subscribing now. Also, if you have already gotten before, don't try accumulating as you might loose your already existing data. While we are still mourning the loss of our beloved MTN N0 free browsing cheat, here is something to console you guys. This is actually for Airtel users so grab your Airtel SIM and follow the instructions. 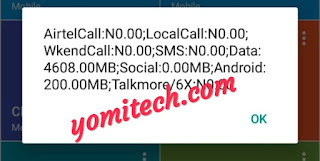 With this simple trick, you will be able to get up to 4.5GB of data for just N200. Unfortunately, just like many other Airtel offers and promos, this tweak is SIM selective which means while many people will be able to activate it, it won't work for some. Step 1. Send GET to 141. Step 2. If you get the message which says "congratulations you can now enjoy 100%...", then proceed to step 3. But if you get that "your smartphone is not eligible", then try another smartphone or another SIM entirely. Step 3. Buy Airtel recharge card of N200 and load it with this format *143*pin#. You will get free 4.5GB data. Step 4. To Check your data balance , simply dial *223#. >> You can accumulate the data as much as you want, just keep recharging using that same method. >> Remember that this tweak is SIM selective. Incase this doesn't work on your Airtel SIM, just click HERE for tips on how to make your SIM eligible. Enjoy this while it last and drop your testimony in the comment section below. Also, kindly share this post with your friends on your various social media platforms. That's because you are already on double data, just go ahead and load ur pin with *143*pin#. Please how long does the data last for a day or a month? Please how long does the data last for a month or a day?? It's Work's Successfully, bless you guy!! Am still on the 600mb android bonus buh I accumulated up to 13gb and I hope to flex it till the end. Is it must that you Will recharge immediately u get the message? not really, but it's advisable you do. Can one subscribe multiple times? My new sim is already on double data. Should recharge with the code straight. I will advice you to follow the spre5 from the beginning. I guess you have sent the message again..
Bro, Thanks it's working fine, Does it have a validity period? Maybe one month or one week? please is this thing still working. It worked for me twice and when I tried to reload this morning I only got 200mb pere!! !